Here are a few more designs that have been rolling in from our concept artists. 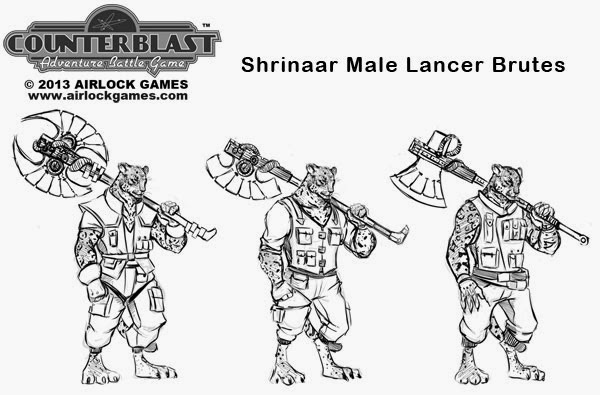 Keri Ruediger worked up a couple of Shrinaar iterations for the Lancers faction. Shrinaar are a race of felinoids whose homeworld, Shrina, was conquered and enslaved by the Neiran during the later reign of Empress Messilina III. Before that time, the Shrinaar had reached early space travel and, having an innate sense of curiosity, had begun exploration of nearby systems, even colonizing several worlds. 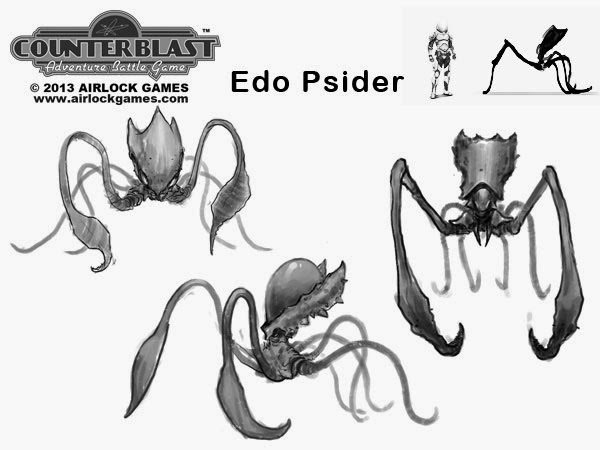 Jeff Paulsrud has provided us with a look at a couple more creatures for the Edo faction. Large and fearsome, a Psider’s abilities can put even the most battle-harded veteran on edge. Psi-ders share the chameleon ability of Eye-Spys, due to the enhanced chromatophores of their skin, allowing them to infiltrate enemy forces. Mighty wielders of the cosmiverse, Psi-ders are able to surround the pseudopods at the tips of their tentacles with Arc energy during their attacks. They can also protect themselves with force fields and have a powerful ability that apparently allows them to fold space and move instantaneously from one spot to another, more limited, not unlike what Jump drives perform for starships. 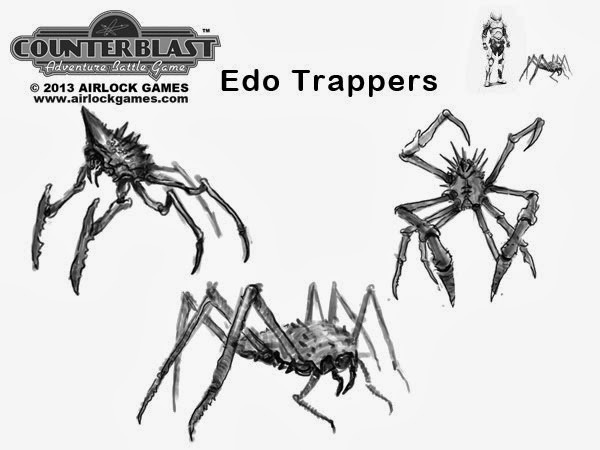 An odd type of spider-crab-like creature, trappers seem to travel with and on Edoflenii forces until under some alien direction they swarm together to surge forward releasing a sticky web-like substance that ensnares and immobilizes any being or creature unwary enough to get too close. As unsettling as they appear, they pose no other danger, seemingly used by the Edo to slow enemies until the main Edo troops can arrive. Bret has fabricated a fantastic new prototype for the Edo faction we have dubbed as the Scutter. His cool Scutter prototype model is kitbashed from a variety of materials and has been used in several of the demos we have have been running at various shows. While Edoflenii seem to be a species that has developed and continues to practice advanced bio-engineering, they also apparently have their own technology as well. An example of this technology are the formidable Scutters. Fashioned in the image of their makers, these machines stride across the battlefield on articulated legs bearing their Edo leader pilots in domed cockpits above. 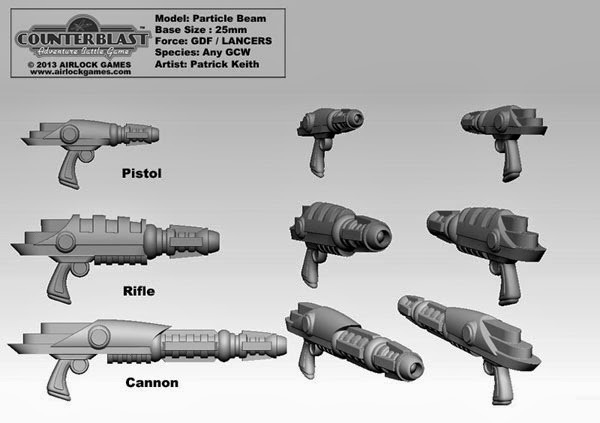 I have been working on many of the weapon designs for the various faction in ZBrush which will be going to print shorly so they can be mastered and added to the sculpts. 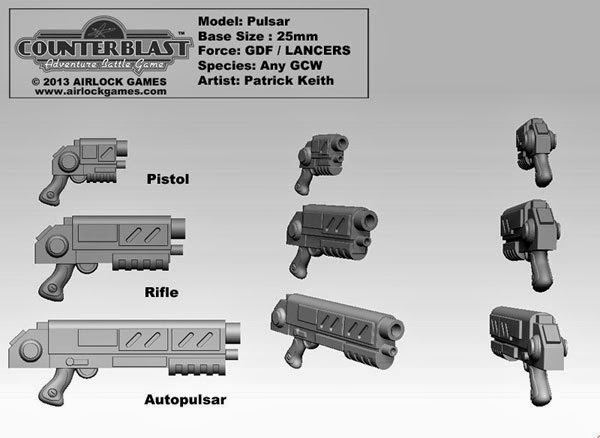 As more art arrives over the next few weeks we will be adding more designs for some of the other factions.